Want tosave 0,65 kn on this order and become Loyalty program member? 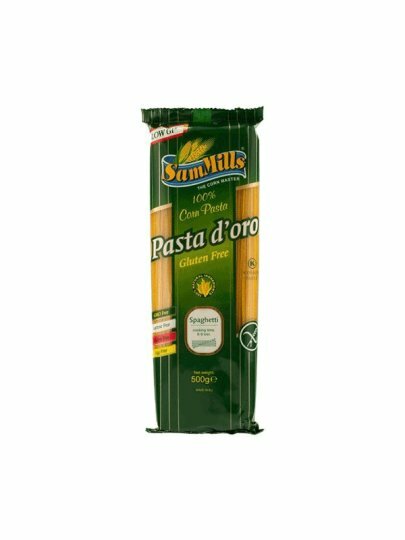 Sam Mills "Pasta d'oro" is a healthy substitute for wheat pasta. 100% natural pasta completely does not contain gluten, eggs, lactose and soy. The product was not genetically modified. It only contains maize and water but retains outstanding quality when cooking while retaining the texture and taste that will appeal to your family and friends. Corn pasta is also easier to digest than wheat, quick to cook and can be used in all your favorite recipes. You can taste the difference! DO NOT contain gluten, lactose, eggs, yeast, soy, nuts, GMO ingredients! Place 80 g of pasta (per person) in 1 liter of hot water and add the salt funnel. Cook on low heat for 9 to 11 minutes, stirring occasionally until you get the desired texture. Drain and serve with sauce as desired.